The Modelica language specification defines two ways that a library can be saved. The complete library can be saved as a single Modelica file or it can be mapped to a directory heirarchy. 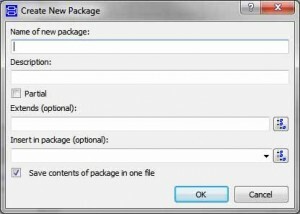 In Dymola this choice is made when creating a new package by the checkbox at the bottom of the dialog, see below. If you later decide you want to change how the package is being stored then select the package, go to the Edit menu and select the Attributes option. When choosing to save the package in one file, a single Modelica model file will be created that contains all the classes defined in this package. Whilst this makes the package easy to copy around between computers it is not really suitable for use with revision control systems.